Description: The B&M slug set has a train in tow and is heading for Albany. Description: Roater shot of the slug set from the uncoupled end. Description: SC 3 rolls south from Mechanicville to Kenwood with a set of power only the D&H could assemble. Description: The "Slug set" has MERU in tow at the Central Vermont (now NECR) overhead bridge west of Miller's Falls. 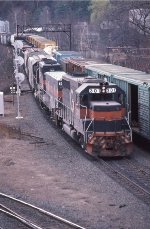 Description: POPY approaches the East Portal of the Hoosac Tunnel as the sun rises on a bitter cold January 20,1985 morning. Description: Slug set on EDNW at Greenfield. Description: EDNW starts around the curve in Greenfield center. 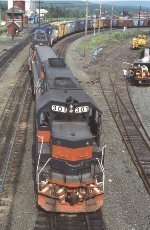 Description: The B&M slug set 300/100/301 leads a Belden tunnel detour train past the Erie station at Susquehanna PA. An NYSW RS watches the proceedings from the set out track east of the station. The RS 3 had been set off due to flat wheels. 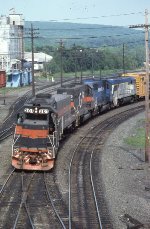 Description: SLN 3, now symbolled DHT9 on Conrail, as it is now a D&H train, rolls west past the Owego station sign at Mc Master St behind, among other things, the B&M road slug set. Description: One of the last GEs on the GTI roster, 281 is the third unit trailing BM300, 301 and leading a D&H blue GP north to Waterville. Just a few months later and the D&H would be bankrupt. Date approximate. Description: Slug set on the Deerfield River bridge near Cheapside. Power for EDWJ.